Let's call these violators what they are - bars. There is no wine production happening on-site. These are not 'tasting rooms' in the romanticized sense, with the proprietor in grape-stained overalls offering samples of the latest harvest maturing in barrels in the backroom. And what is an 'event center' but a bar that's closed for a private event? Matthews moved their wine production to Walla Walla years ago. A bar serving wine and beer from: Silver Lake Wines, Roza Hills Wines, Grapeworks Distilling, Fish Brewing Taproom, and Girly Girl Wines. 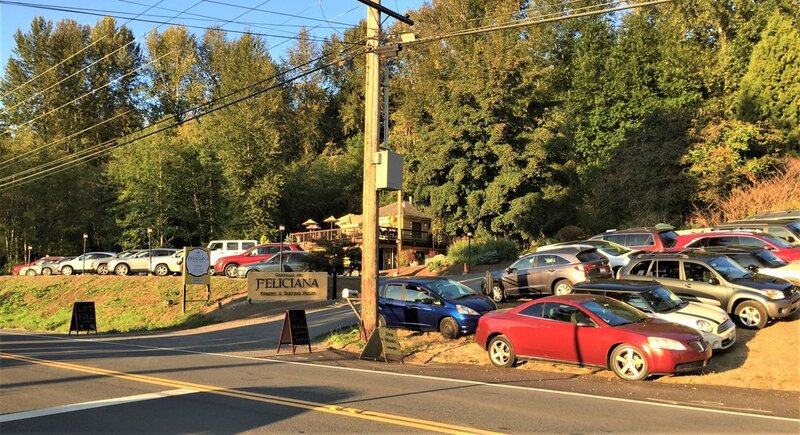 Tenant: Castillo de Feliciana tasting room (just north of Tolt Pipeline Trail). Wine production is in Walla Walla, WA. Tenant: Cougar Crest tasting room (in the small roundabout cluster south of the main Hollywood Hill roundabout). Wine production is in Walla Walla. Tenant: Cave B tasting room (small southern roundabout cluster). Wine production is in George, WA. 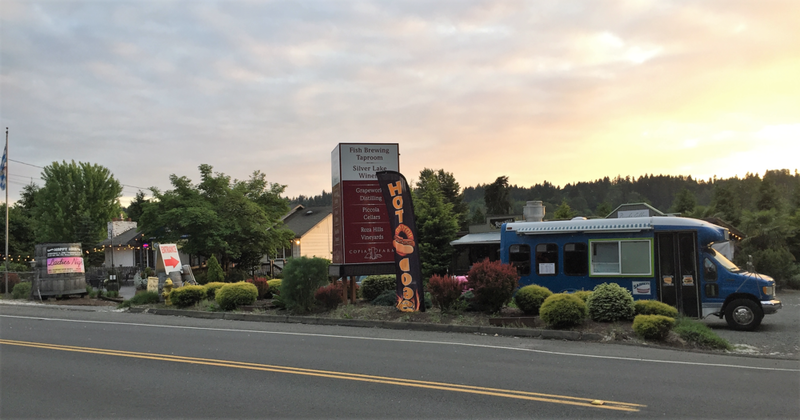 Tenants: Patit Creek Cellars and Forgeron Cellars tasting rooms (small southern roundabout cluster). Wine production for both wineries is in Walla Walla. Tenant: DeLille Cellars Chateau (event center). DeLille stopped making wine here several years ago. Wine production is elsewhere in Washington State and will soon be moving to the former Redhook property. Formerly cited for holding events at the Chateau without proper permits. It's not the case that these code violators have nowhere to go. The City of Woodinville has plenty of nearby retail and commercial space available, with sewer hookup and other infrastructure in the properly zoned Urban Area. Approximately 170,000 sq ft of new space is available just north of Chateau Ste Michelle on Hwy 202 where a number of beverage businesses are already located. An additional tens of thousands of square feet of new retail space is in the works in the Central Business District, and numerous existing properties are available for rent or purchase. Friends of Sammamish Valley is supportive of the wine tourism industry, as well as having true production wineries in the Rural Area. We believe that the handful of illegally operating tasting rooms and event centers in the Rural Area should move into the nearby Urban Area - joining the vast majority of tasting rooms and event centers already operating there legally. Our amendment to the Ordinance proposes that the violators be given a 12-month grace period to move to a new legal location or cease illegal operations. Note that King County has already given violators a 3+ year grace period by freezing zoning enforcement while the Wine Study was conducted. Drive-up retail businesses need the infrastructure that already exists in the Urban Area such as sewer hookup, parking, sidewalks, lighting, and better ingress/egress from access roads. Operating in the Urban Area will help solve infrastructure problems while also enabling these businesses to have longer hours and more customers without the negative side effects of traffic, parking lots, noise, and visual pollution that deeply affect the rural neighborhoods and farm businesses. 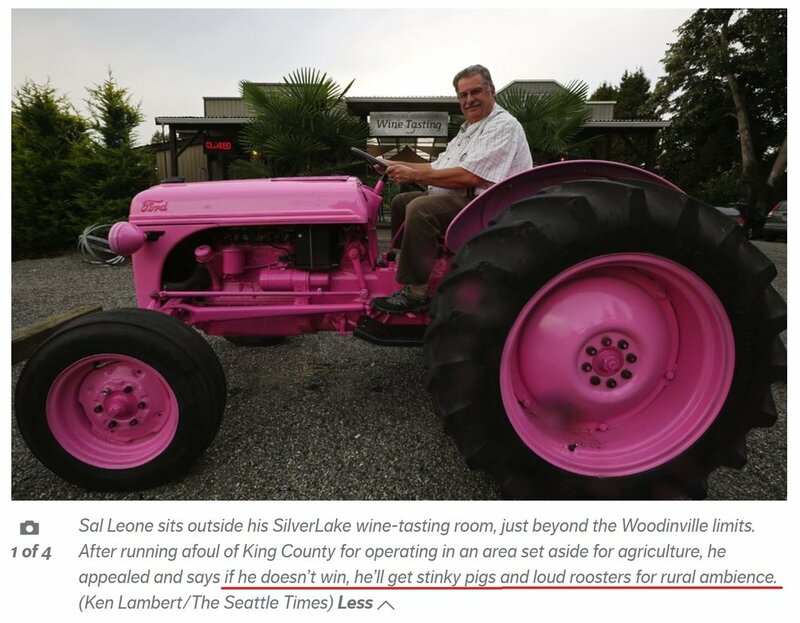 These negative side effects are additionally counterproductive to the local wine industry itself which in fact relies on the visible presence of open lands and agriculture and the bucolic nature of the Sammamish Valley to draw in tourists from around the Puget Sound. One kind of commercial retail use in a Rural Area often begets other kinds of retail. Not only in the Rural Area, but also directly on land in the protected Agricultural Production District (APD). One such operator is already open for business and has purchased another nearby property. Situated on land zoned as Agricultural A-10 farmland on the west side of the arterial road, he is illegally operating an antiques store and a bakery/coffee shop. Heavy equipment and construction materials for another business are being stored behind the bakery.